Shop at BedSheetDirect.com for factory direct discount prices on all of your favorite Home D�cor, bed sheet and bedroom accessories including Kantha Throws, which is becoming a craze in Home D�cor ! Our aim is to provide our customers quality bed sheets at discount price. Here you will find discount deals on sateen bed sheets, cotton bed sheets, bed linens, towels, sheet sets, bed sheets, bedding sheets, sheets, bedding and more. 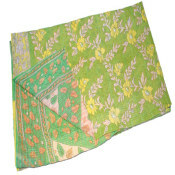 Kantha Throws and Quilts are the latest �hot products� in home d�cor. 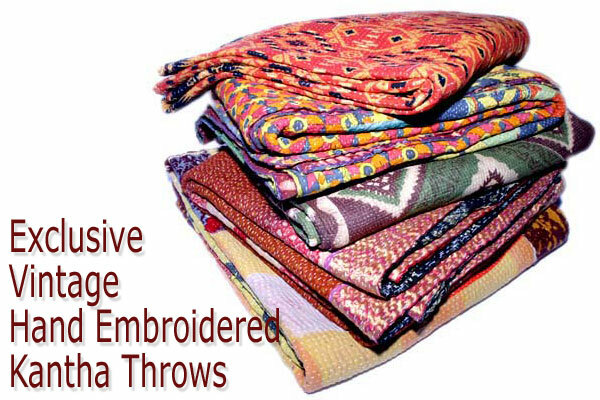 Kantha is a type of embroidery originated in West Bengal (India) and Bangladesh. Any garment or cloth with Kantha embroidery, predominantly having decorative running stitch motifs may be called Kantha garments. Traditionally Kantha embroidery were preserved and reused in vintage cotton saris. 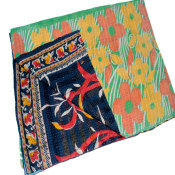 The use of recycled materials made Kantha throw earth friendly! Women in the villages especially in states like West Bengal, Gujarat and Rajasthan, sit together and sew these with hand (kind of embroidery work for them) by sewing layers of cloth and often vintage saris together and then stitch using a traditional, delicate �Kantha� stitch to make a light blanket, throw or bedspread. Kantha originated from the way in which Bengali housewives mended old clothes by taking out a strand of thread from the colorful border of their saris and make simple designs with them. Kantha throws have become more and more popular over the past several years in western interiors. Some like them because they are reversible and lightweight. But more than that, these cotton quilts are usually quite colorful with gorgeous patterns and patches. They are far more gorgeous in person than in photos. The reversible cotton is easy care. You may want to just stack the Kantha throws on top of your white wooden cabinet in the sitting room � not only they add color to the room and a jolt of personality - they are available for warmth when snuggling on the sofa at night and by day. Throw one on the end of the bed or drape it over a couch to add that splash of color and enjoy the unique hand embroidered motif. Get a Kantha throw and toss it on the table creating a colorful scene with a gorgeous, exotic cover that will be a conversation piece. 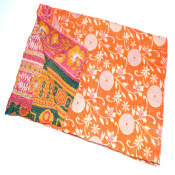 Kantha Throws make great wedding and baby gifts too. 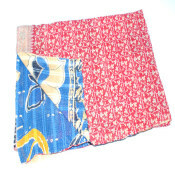 Kantha throw are fantastic for adding colors or an unusual design element to your home. Some of the comments from people who have bought Kantha Throws. For bed sheets, fabric content is an important factor. 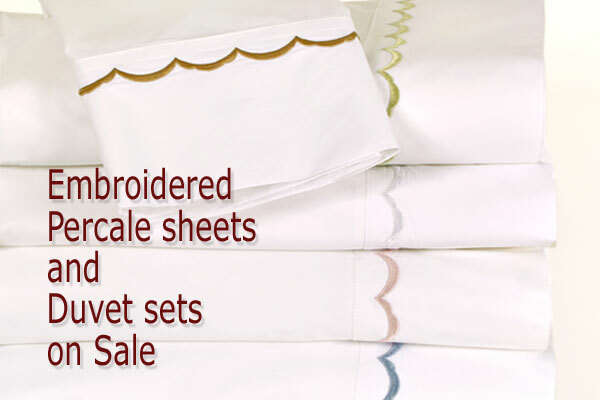 We offer a wide range of 100% cotton bed sheets. There are different grades of cotton, which are determined by the length of its staple or fiber. The longer the staple, the more luxurious and durable the grade of cotton. 100% cotton bed sheets are the softest and most breathable. The natural cotton fibers pull moisture away from your body, giving you pleasant sleeping experience. Cotton is a natural fiber and will absorb the moisture of your skin, keeping you cool. Polyester and microfiber bedding is less expensive and while cool at first, quickly warm and does not give a natural feel. Here at BedSheetDirect.com, you will find the best quality cotton bed sheets and bonus sheet sets at most unbelievable price. One of the most important things to take into consideration when purchasing cotton bed sheets is the thread count. Thread count, abbreviated as "TC", is the number of threads per square inch of fabric both vertical and horizontal. If you are looking for the softest and most durable sheet, the higher thread count will always be the best. Look for it to be at least 300 thread count or higher. 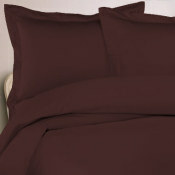 Bed sheets for every lifestyle with thread count of 300, 400, 450, 500 and 600 can be found at BedSheetDirect.com. We carry bed sheets that fit an array of beds. We sell Twin sheets, Twin XL sheets, Full sheets, Queen sheets, King sheets and even cal king sheet sets. You can use our Size Chart for reference. All our bed sheet sets come with matching pillowcases.